Chance the Rapper made a terminally ill teenager's wish come true Thursday after meeting her at the Lou Malnati's Pizzeria at Midway. 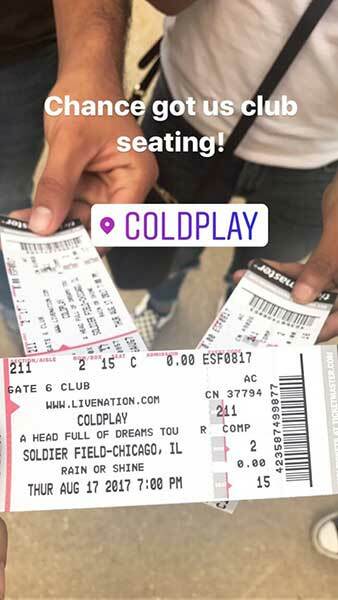 CHICAGO (WLS) -- Chance the Rapper made a Chicago teenager's wish come true Thursday by scoring her tickets to see Coldplay, her favorite band, perform at Soldier Field. Heidi Hernandez, 17, who has been battling a serious disease since she was 3 years old, attended the concert in club seating with her boyfriend, Jorge. She said the band's music helped her through tough times and hopes that one day she can meet lead singer, Chris Martin. Hernandez works at Lou Malnati's Pizzeria on the Southwest Side while also completing high school, and although her health is declining, her manager at Lou Malnati's said she continues to come into work multiple days a week. Hernandez was diagnosed with primary sclerosing cholangitis at age 3. She received a liver transplant from a donor at the age of 9, but unfortunately the disease came back with the new liver. Heidi was also recently diagnosed with hepatitis autoimmune and is showing signs of liver failure again. Doctors say she needs a second liver. "I got into a really bad depression where I wouldn't even be able to go to school. And I just started listening to [Coldplay's] music and it made me feel a lot better," she said. Hernandez's manager, through a contact, was able to reach out to Chance the Rapper about obtaining the tickets. For her, being at the concert was about more than just the music. It was also about dreams that never die. "Become an organ donator. You can always save a life. It may not be my life, but you can save so many lives with just one person," she said. Coworkers described Hernandez as a fighter who withholds perseverance in every aspect of her life. "I've only known her as a 'boss'...even though I'm supposed to be a leader and teach her. She has taught me more than I can even offer her. When she first started, what broke the ice and sparked endless conversation was the mutual obsession for Coldplay. Today I now consider her like a little sister, my family," said Tori, Hernandez's manager.